You might expect all vestiges of colonial life to be slowly fading from Asia’s modern, busy cities. But instead elements of those days, particularly the ones relating to the tourist trade, are being recreated, preserved and celebrated. If you are travelling on a budget, many of the region’s colonial-era hotels may seem prohibitively expensive but you can still get a taste of days of yore, should you wish to, in a hotel bar with an afternoon gin and tonic or taking high tea in a hotel lounge. Modern Kuala Lumpur is like any big developing Asian city: malls, traffic, more malls, street hawker stalls, Chinatown, nice bit where diplomats live, shiny towers, malls … But there’s a pocket of KL that will be forever England. High tea at the Majestic Hotel in Malaysia. Photograph: Brigid Delaney/The Guardian. 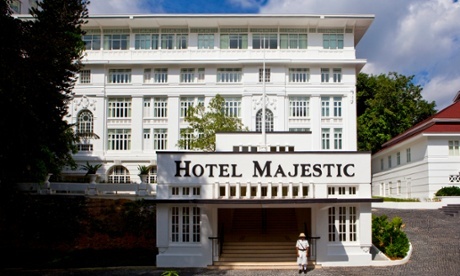 Arriving at the Majestic Hotel – built in 1932 and recently refurbished – is like stepping into a Somerset Maugham novel. There’s a smoking room, where guys in linen suits (seriously!) light up, play pool and drink whisky; there’s a screening room that shows black and white movies from Hollywood’s golden age; and in the suites there are deep, lovely clawfoot baths where you can wash away the humidity and sweat of life in the hot zone. 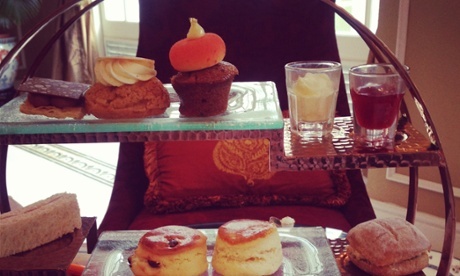 During my stay at the Majestic (a 51-room hotel that combines neoclassical and art deco style), every afternoon the lobby was full of people enjoying English-style high tea – with plates of cakes, scones and pots of tea. Being serendaded by the piano “takes guests back to 1932”, one of the staff told me. Galle, the capital of the southern part of Sri Lanka, is a Unesco world heritage site, and the Galle fort was built by the Portuguese in 1588 then fortified by the Dutch during the 17th century. Many of the Portuguese- and Dutch-era buildings have been restored and renovated, but one of my favourites is the Galle Fort Hotel. Restored to its former glory, the hotel is one of the pricier places to stay in town (up to 0 a night in peak season) – but you can soak up the vibe simply by having a G&T in the hotel’s bar, which is a pleasant porch area out the front where you can sit amid the tropical blossoms and watch the street life pass by. Colonial Jakarta is a crumbly mess: beautiful old buildings with white cracked paint and trees growing out the windows; boarded-up windows and creaky narrow staircases where ravens now nest. It’s as if the city doesn’t have the heart to tear down the old buildings but lacks the money to restore them. There is one notable exception – Cafe Batavia. Originally built circa 1805-1850 as administration offices before becoming an art gallery in 1990, an Australian, Graham James, bought it in 1991 and reopened it as Cafe Batavia in 1993. 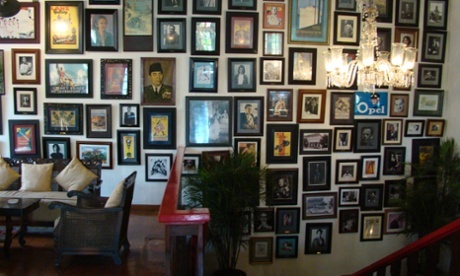 There are black and white pictures all over the walls, an old piano and historical trinkets. The food is a pricey by Indonesian standards but the atmosphere is like stepping back in time. If you want to stay at a heritage hotel in Jakarta, then the Hermitage Hotel is a welcome change from many of the capital’s gleaming chain hotels. Situated in the historical district of Menteng, in central Jakarta, the hotel is in an art deco building from 1923 that was once a Dutch Telecommunications office. On the grounds of a coffee plantation, surrounded by a ring of active volcanos, Mesa Stila in Central Java is strange, almost otherworldly place. Now branded as a health and wellness resort, with an excellent spa, it’s buildings and furniture hark back to Dutch colonial times. 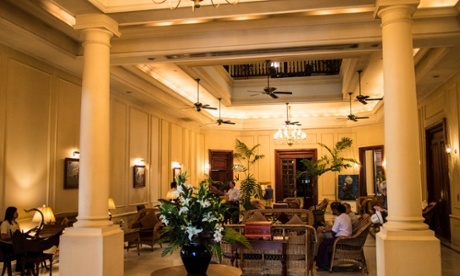 In the central lobby, ceiling fans, wide day beds, a large verandah and a piano all add to the colonial vibe and afternoon tea is served daily. 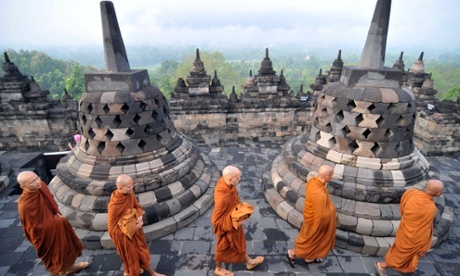 The hotel was a favourite of the former Indonesian president Susilo Bambang Yudhoyono and only a few hours away from the incredible Borobudur temple complex. The Strand’s website declares it was named “the finest hostelry East of Suez” by John Murray in his Handbook for Travellers written in the early 20th century. Built in 1901, the three-storey, five-star hotel boasts that it’s one of south-east Asia’s “few grand colonial hotels and one of its most awe inspiring”. All the rooms were booked out when I visited Rangoon a few months ago (you need to book a long way in advance – there’s a shortage of hotel rooms in the capital) but there were plenty of seats at the bar. Make sure you bring your copy of George Orwell’s Burmese Days to complete the experience. Raffles is a colonial icon – famous for its liveried Sikh doormen and its Singapore Sling house cocktail. Open in 1887, Raffles Hotel Singapore is a prime example of colonial architecture, boasting period furniture and a tropical garden. 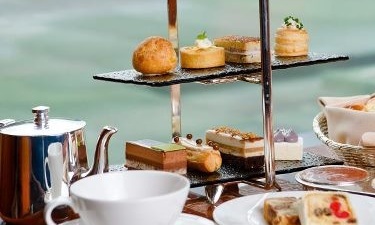 High tea is popular at Raffles – and you’re encouraged to book ahead. It’s the usual fare of cakes and crustless sandwiches served on a three-tiered stand, in the beautiful Tiffin Room. While you nibble on your sandwiches, a harpist plays in the background. One thing I noticed at high teas at both the Majestic and Raffles that would have been unheard of in Maugham’s day: pretty much everyone, at every table, photographing their food.